NASA's Terra satellite analyzed Hurricane Hector in infrared light to find the strongest parts of the storm. Overnight from Aug. 1 to Aug. 2, Hector strengthened into a hurricane in the Eastern Pacific Ocean. 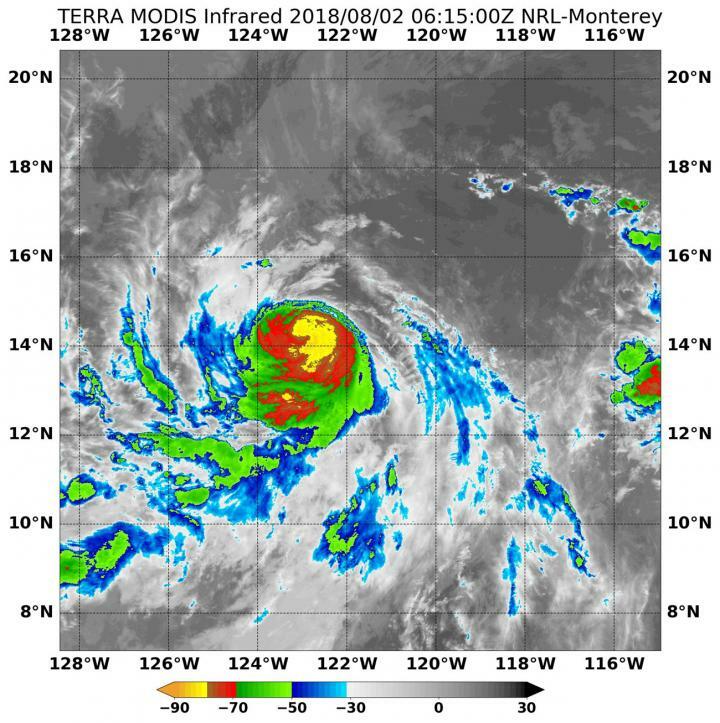 On Aug. 2 at 2:15 a.m. EDT (0615 UTC) the Moderate Resolution Imaging Spectroradiometer or MODIS instrument aboard NASA's Terra satellite analyzed Hector's cloud top temperatures in infrared light. The higher the storm, the stronger the uplift, and likely the stronger the storm. By analyzing a storm in Infrared light, scientists can tell cloud top temperatures that give clues about the location of the highest, coldest and strongest storms. MODIS found cloud top temperatures of strongest thunderstorms were as cold as or colder than minus 80 degrees Fahrenheit (minus 62.2 Celsius) around the small eye. Cloud top temperatures that cold indicate strong storms that have the capability to create heavy rain. The National Hurricane Center (NHC) noted at 11 a.m. EDT (100 UTC) on Aug. 2, the eye of Hurricane Hector was located near latitude 14.2 degrees north, longitude 124.6 degrees west. That's about 1,135 miles (1,825 km) west-southwest of the southern tip of Baja California, Mexico. The estimated minimum central pressure is 987 millibars. Hector is moving toward the west near 14 mph (22 kph), and this general motion is expected to continue for the next few days. Maximum sustained winds have increased to near 85 mph (140 kph) with higher gusts. Additional strengthening is forecast during the next few days. NHC forecaster Blake noted "Hector has turned westward and accelerated, now moving 12 knots. A large subtropical ridge [elongated area of high pressure] is forecast to build westward over the next several days, keeping the cyclone on this general course into the Central Pacific."